Powercharms | Double sided charms and ornaments created for you. 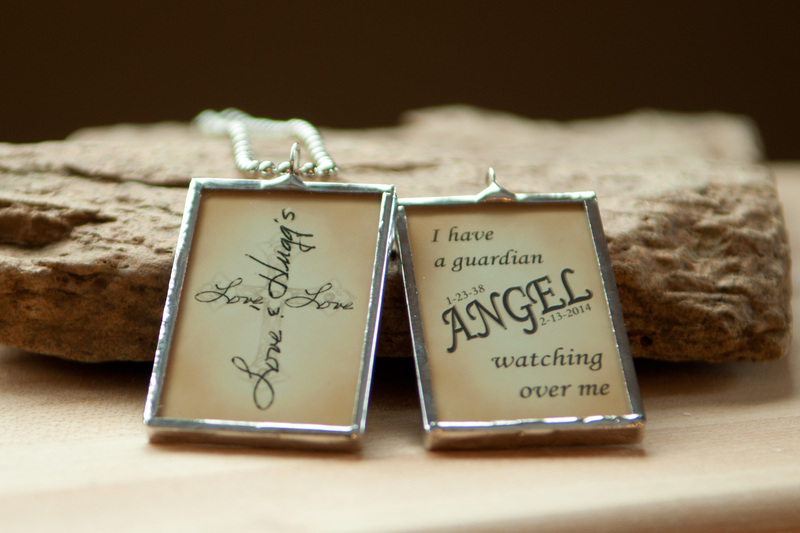 Double sided charms and ornaments created for you. ORDER BY DECEMBER 1st and SHIPPING IS FREE. Thank you for taking the time to stop by and see what POWERCHARMS can do for you. We have created many collections so I am sure you will be able to find a piece that fits your need. Please take a few minutes and browse through the many options. I love creating so if you have another idea in mind, please contact me and we can work together to create that piece. Due to the personalization of each piece, orders are taken by contacting me through email. 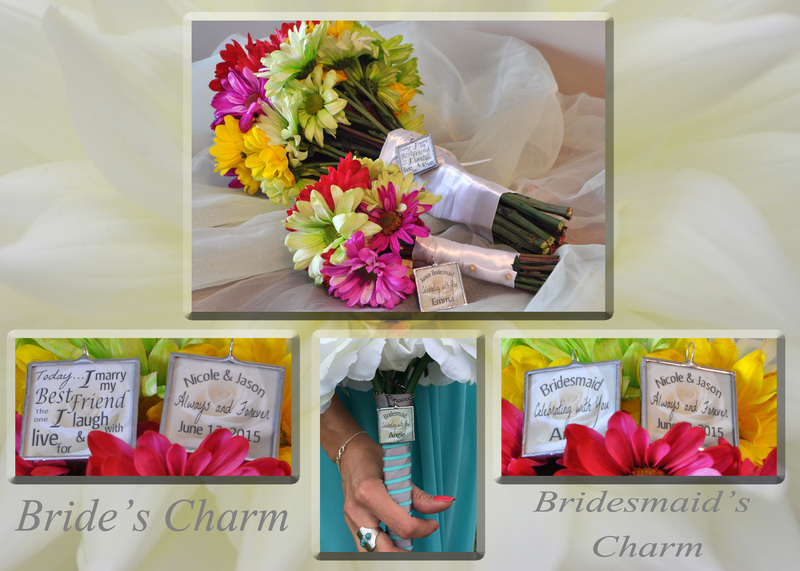 These charms are a perfect way to personalize your bouquets for your special day. Each charm is 1 1/4″ square and has two sides. I will work with you to create a piece that you will be happy to display. If you prefer, a photo of the bride and groom can be placed on one side of the charm. Many different options to help make these your special pieces. If you order 5 charms, you will receive a free one for your bridal bouquet. Please email me or call if you have additional questions. 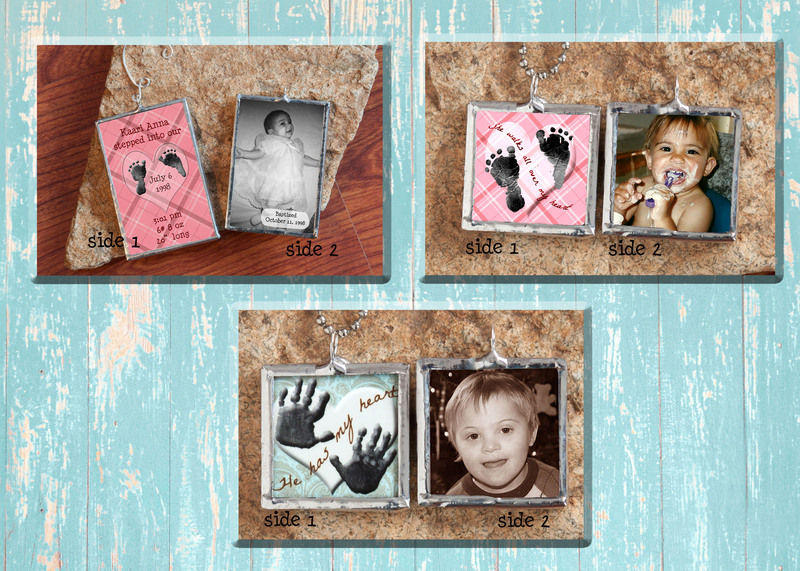 Hold a memory close by preserving your child’s hand or foot print. 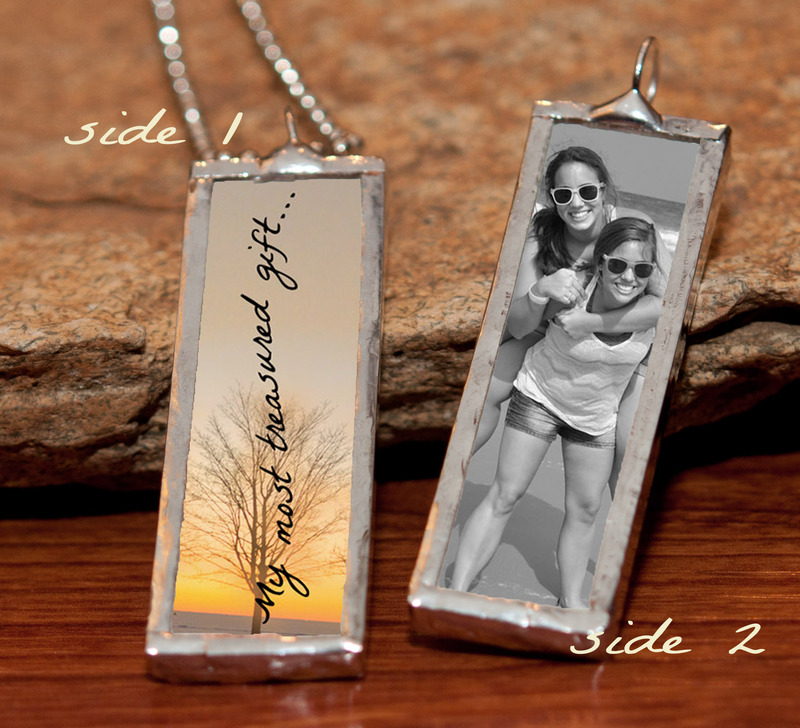 Each piece is double sided so you can add a special picture, piece of art work, or quote on the second side. The images are encased between glass and sealed with solder. Once you decide which piece you would like to create, you will send a digital image of the hand or foot prints along with a picture for the second side. It tends to work well to use a camera phone to take a picture of the prints. I ask that you take the picture looking straight down and make sure the picture is in focus. Once the images are received the work will begin. The more information you can provide when ordering the faster the proof will be created and sent for approval. Once approval have been given on the proof, the piece will be created and sent out within a week and often times much sooner. 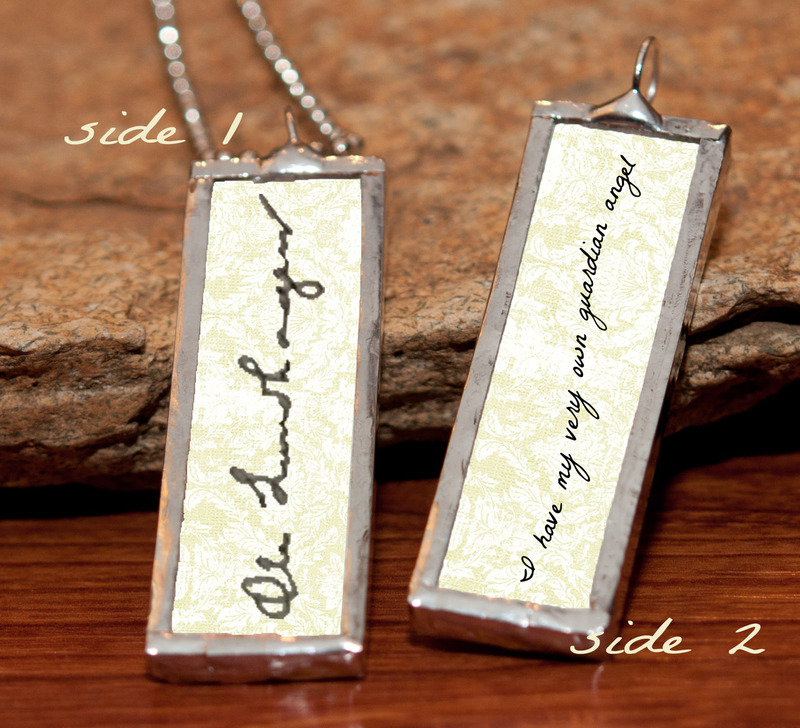 Create a special piece with a signature or hand written note. I will work with you to create a piece that will live with you forever. Each piece is double sided so you have endless options when creating your piece. Once you make your decision on what piece you would like to order, you will send me a digital image of the signature. It works well to take a picture of the signature with a camera phone and email it to me. When take the picture, it works best to take the picture by looking straight down at it. Please make sure that the image is in focus. Prices below are based on one signature. 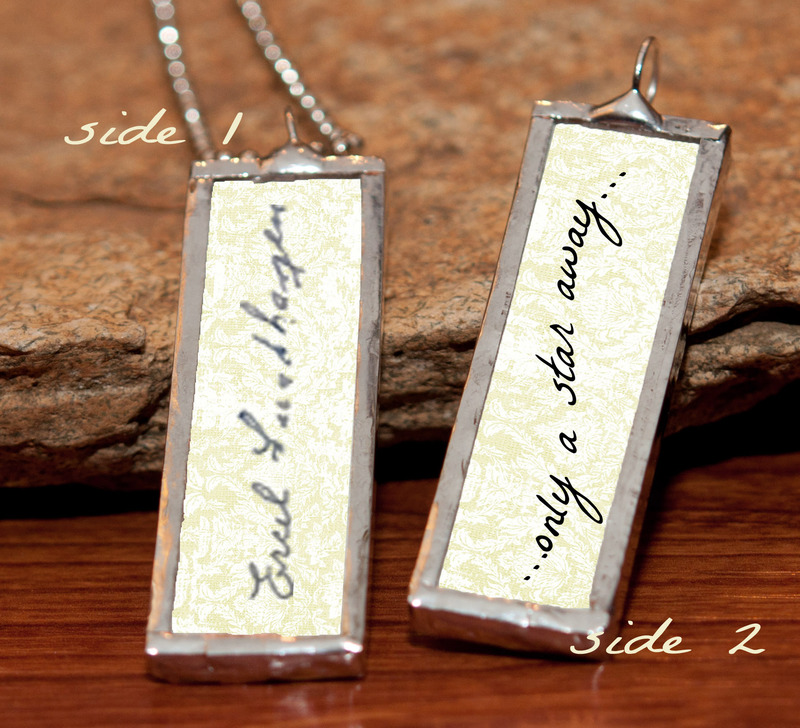 If you would prefer a different signature on each side, please add $2.00 to your piece. If you enjoy photography, or have a favorite photo, why not have a piece created using your own photos. 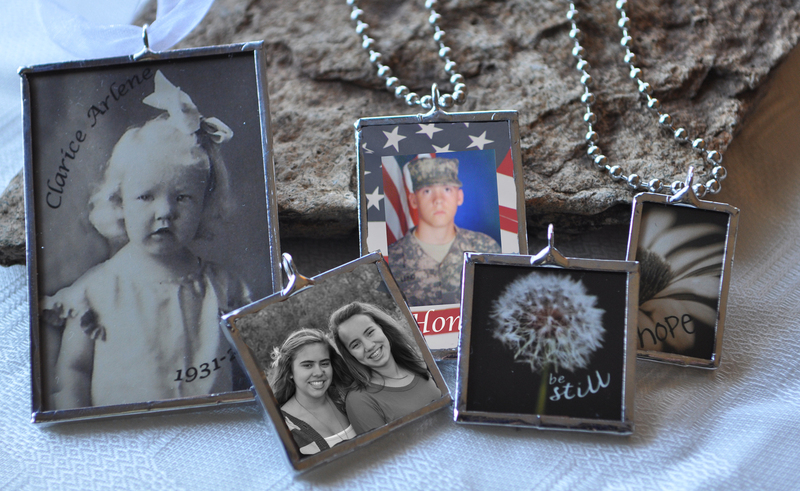 Each charm consists of two photographs soldered between glass to create a double sided charm or ornament. Any of these charms and ornaments can be created using my pictures or yours. Minimal photoshop work is available at no additional cost. Please look through my collections to become inspired and then let me help you create a special piece . 3/4″ x 2″ long charm $13.00: This is the newest addition to my collections. It is a very fun charm if you have just the right picture. Shipping rates are $3.00 for the first item and 50 cents for each additional item sent to the same address. Payment can be made through paypals or by personal check. If you need help determining which size piece will best meet your needs, print off the sizing chart below on an 8 1/2″ X 11″ piece of paper. Hold onto a memory of that special person who is no longer with you. 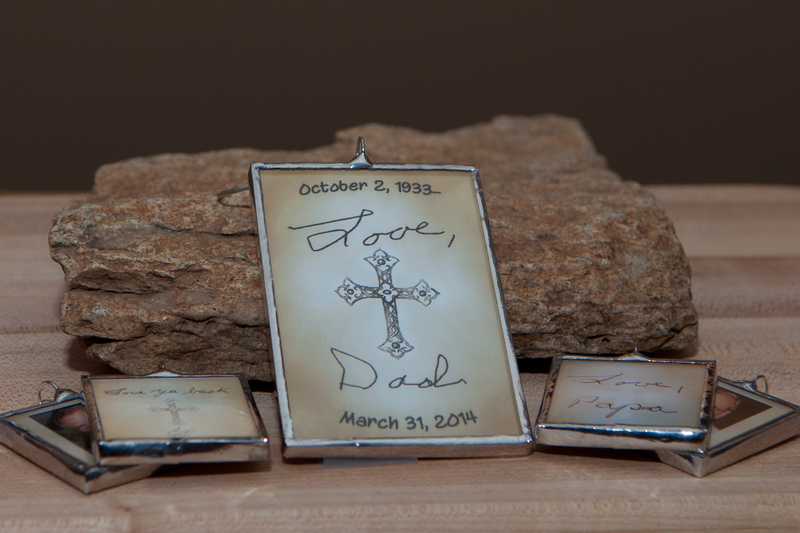 Ornaments or charms can be created to help comfort you as you adjust to life without your loved one. Each piece is double sided which allows for many options. Maybe you have a couple pictures you would like to use or maybe a special quote. These pieces allow the flexibility to create something that will bring comfort through the difficult days. 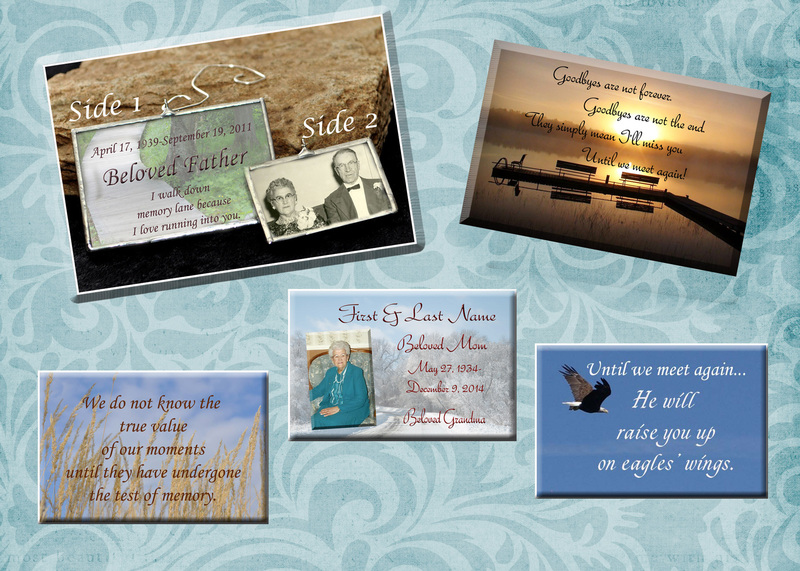 I have created many memorial pieces and have a lot of samples I can send to help start creating your piece. Signature charms are also a special way to hold onto a treasured memory.